The architect behind it all is Louaie El Rowidi, a passionate and determined entrepreneur with an authentic marketing mind. 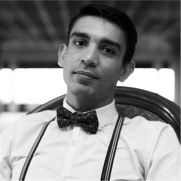 A commercial economics alumnus of the Amsterdam University of Applied Sciences, Louaie is always seeking to push the boundaries within his field. He began his journey to conceptualising Cabture with Bikevertise, a similar concept to Cabture but with the deployment of bicycles as an advertising device. Three years later, in 2014, his vision of mobile marketing progressed and expanded into taxis as a genuine advertising tool, and voilà - Cabture was born. Cabture has essentially unlocked the potential of your taxi experience by utilising taxi advertising effectively. While advertising in taxis may not be one of the more conventional or popular routes for brands to take, the citywide reach that taxi's can provide for businesses make it a very powerful advertising tool for establishments. The average taxi travels 125 miles each day, and they are usually concentrated in key areas for advertising such as train stations, airports and high streets, where they are surrounded by people with the frame of mind to spend money. Over the last few years, Cabture has built a prestigious client list of local and international brands including McDonalds, Samsung and Heineken. As a result, it is now regarded as one of the more cost-effective methods for maximizing your brand exposure. 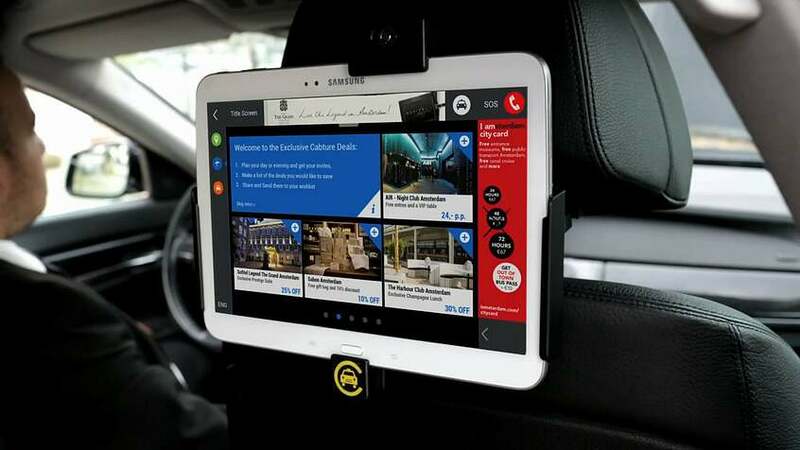 Cabture offers the CabTab, an innovative tablet with essential travel information and exclusive deals, as well as the CabTop, which offers brands and businesses the chance to advertise on the cabs themselves, whether that be on the sides or on top. Cabture are truly utilising the full potential of a customers travel experience. What is the team up to today? Recently, Cabture took part in Amsterdam Capital Week, a week-long programme focusing on connecting all kinds of capital with both national and international startups. During the week, Cabture took part in a wealth of activities, and even found themselves finishing second place in the highly regarded global start-up competition Get in The Ring. In addition, Louaie was found leading a presentation at the Startup Bootcamp for Smart City & Living where he discussed the potential of mobile, digital and transport advertising, as well as outlining the future and history of Cabture. So why should I invest in Cabture? What makes Cabture unique as an investment, and as a company? "Our passion, dedication and unique business model. We are focusing on creating the ultimate travel experience, simultaneously increasing the safety and service standards in the taxi industry. We are the first and only company to do this." What will a potential investment achieve for Cabture? "With the Eureeca investment we will further improve our software, optimise the company for scaling up, and equip the company with the right resources and specialists to grow." Why use Crowdfunding as an investment route? "We want our investors to have interest in our company and product. This way the people that invest become an important group of supporters that can really help us grow further." Having firmly established the business in the Netherlands, do you have any expansion plans? "Yes, we have a letter of intent from one of the biggest taxi firms in Austria, which wants us to deploy the CabTab in all of their taxis. This will be the first step in our upcoming international expansion. We’re also looking into expanding to the UAE." What gives you an edge over your competition? "At this time there is no other company that is focusing on creating the ultimate travel experience while increasing safety and service standards in the taxi industry. We are special, because we add value to all of the groups that are related to our business- taxi drivers, passengers, and brands. Everybody loves us, isn't it great?" With Uber now established as the modern go-to taxi solution all over the world, are their any plans to integrate Cabture with the multi-billion dollar company? "We treat Uber exactly the way we treat all of the taxi organisations - as a potential partner. We do not see the space for integration at this stage, but we also do not recognise ourselves as a potential competition. We would love to be providing additional income to their drivers and improving the customer experience of Uber’s passengers as an independent party- this will not change. Also, we do not want to limit ourselves by merging with any big partner - we want to cooperate with the best drivers, no matter on whose payroll they are." Finally, Where do you see Cabture in the next few years? "Imagine traveling by taxi from your house in Amsterdam to Schiphol Airport: one of our CabTabs welcomes you and advises you to check in for your flight to Buenos Aires. The taxi driver knows the gate from which you are flying, so you will be dropped at the closest entrance. You can also compare offers of duty-free shops at the airport with prices on the board of your aircraft- you will certainly pick the best offer. As soon as you take your seat on the plane you can enjoy the choice of the newest movies, play amazing games, or simply browse the Internet on the screen of one of our tablets or on your device, using the WiFi that we provide. What if you land during the most dramatic moment of your movie - 10 minutes before it ends? The movie will resume on the screen of the taxi that you take right after landing in Argentina. You can also exchange your currency right there on the tablet’s screen, find information about the city, and book dinner in a restaurant. All of that - and much more - in one, uniform product. Your travel experience will always be like this from now on- unique, consistent and way more interesting than ever before. Cabture's other great ambition is to cooperate only with the highest-quality taxis, in order to set a uniform standard for our services. Wherever in the world you may be, if you need a taxi, you take only the one with the Cabture logo. What does it mean from a business perspective? We aim to build a real empire within the travel industry. Taking care of the interest of all of the parties involved in the travel experience - transportation companies, travellers, and brands - we create a unique offer. It is great to deliver something that everybody likes, right? We hope that in five to seven years, our systems will be used by the best taxi companies in all of the major cities in Europe, Americas, and the Middle East. From there we will expand to the other continents. We also intend to have our systems placed in multiple airlines by that time. Being active in 30 major cities, with an average number of 1,000 taxis per city, and working with five major airlines, would mean that over 600,000 passengers use our systems every day. How does it transfer into revenues? With our current pricing model that would mean over EUR 400,000 of revenue a day, EUR 12M a month and about EUR 150M of revenue a year. That is an optimistic scenario, but with our motivation and active approach, nobody can tell us that it is not a possible achievement. And that will still be the beginning, not the end, of the Cabture’s story." Click here if your interested in investing and finding out more about Cabture. If you want to see what the team is up to today, follow @cabturemedia on social media platforms Twitter, Facebook and Instagram.